You don't often find Xinjiang cuisine readily available in most Chinese restaurant. This underrated province in far west China has always been in the shadow of the more popular Szechuan and the ubiquitous Cantonese. Quite frankly, they have some of the tastiest dishes that are right up there in terms of flavours on par with those popular Chinese takeaway favourites. So, a brief breakdown on Xinjiang for you. Xinjiang 新疆 means “New Frontier,” and the name couldn’t be more apt. This remote land is well off the beaten path and most visitors who make it out to Xinjiang do so on an itinerary following the Silk Road. It is a place of tremendous natural beauty and has a fascinating cultural heritage very different from what you’d find anywhere else in China. Majority of the population are not Han Chinese but mostly Uyghur, Kazakh, Mongol, Tajik or Kyrgyz. As for the cuisine, muslim influence is quite apparent. Cumin, cardamon and other spices which are not common to other regions in China is prominent here. 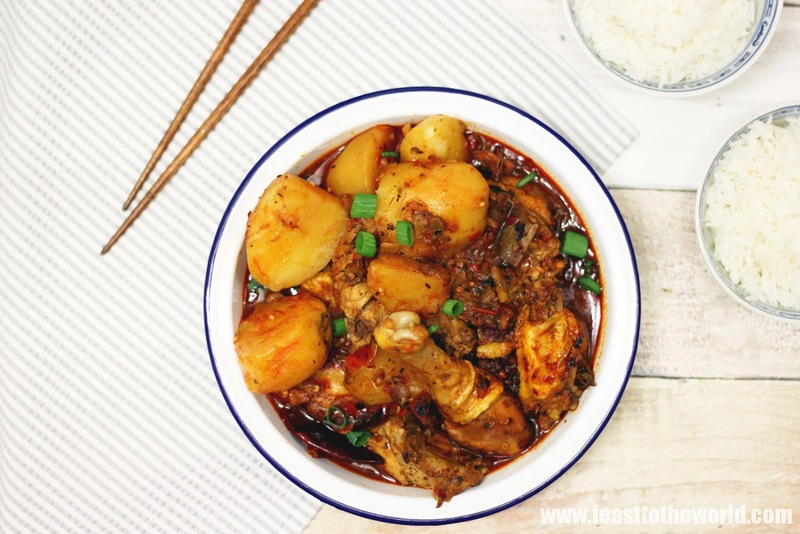 Big Plate Chicken or Da Pan Ji 大盘鸡 is without a doubt the most popular dish to come from this region. 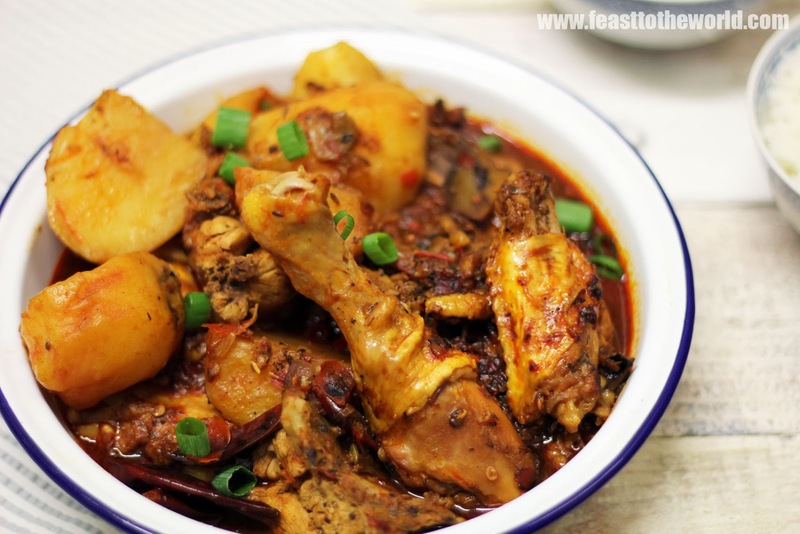 This spicy, crimson-red chicken and potato stew is commonly served in a ginormous plate and hence the name. It is rich and full flavours and is often shared amongst many diners as to finish one plate on your own can prove a rather challenging task. 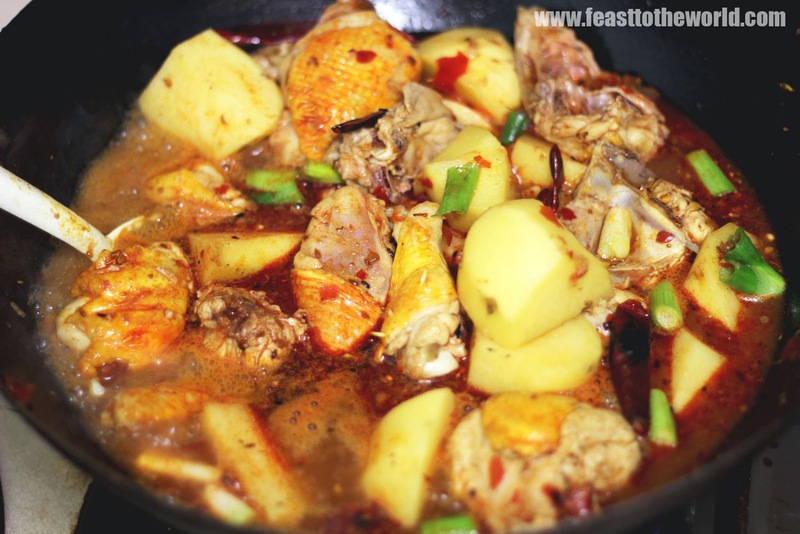 Traditionally, the chicken are eaten first before adding the mandatory flat wide hand-pulled noodles to the hot gravy. The flavoursome gravy will cling onto the noodles while you slurp away, devouring every drop of this tasty sauce. Immensely satisfying and oh so good. For my version, I make do without the noodles but you can of course buy readily available noodles and cooked according to the instructions on the packaging and serve alongside. On this occasion, I had mine with a potful of steamed rice…..yes, enough rice to soak up all the wonderful sauce. 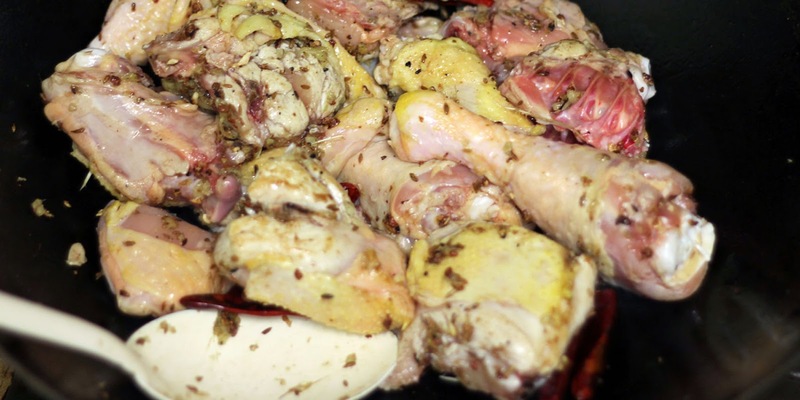 Try to use a whole chicken and chopped this into bite size pieces if you can or at least make sure the meat in on the bones. Believe me, the flavour will be so much better. I used beer to give the dish a more robust depth, water will do just fine. Make sure you dish out onto the biggest plate you have, the bigger the better (you need this to do justice to the dish's name). It's not called Big plate chicken for nothing. Anyway, you will definitely need a large vessel in order to contain the finished dish. For styling purposes, my plate is a tad small so do not replicate. Heat the wok over a medium high heat. 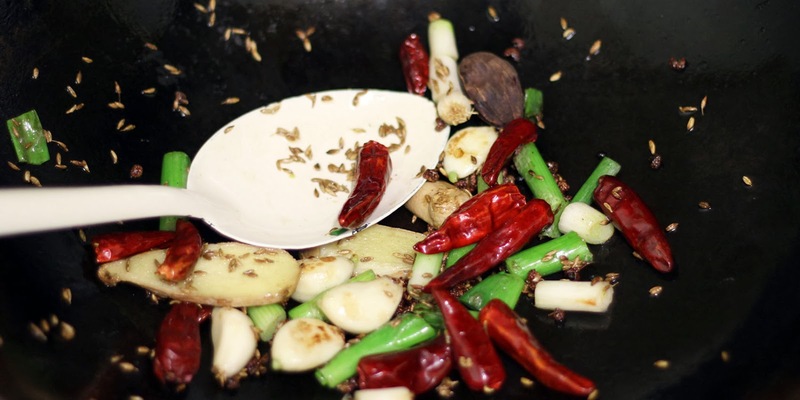 Add the sunflower oil and when smoking, add the ginger, garlic, spring onion, chillies, Szechuan peppercorns, cumin and black cardamon and stir fry for a 30 seconds, until fragrant. Add the chicken and stir fry for 1-2 minutes to lightly seared the chicken and coat with all the aromatics. 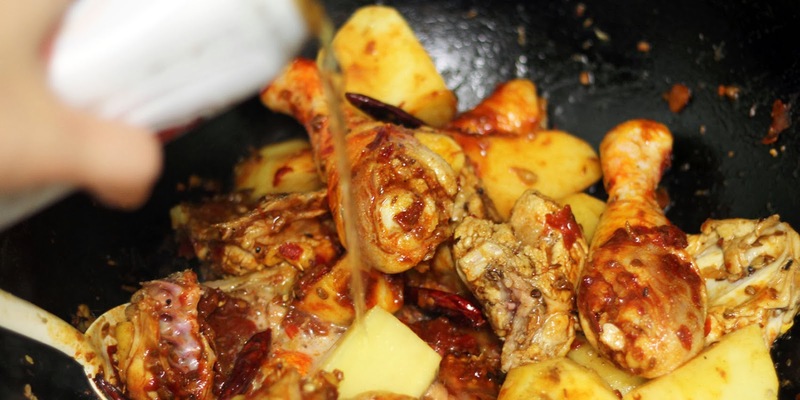 Add the hot broad bean paste, stir the chicken to mix with the paste before adding the rice wine and beer, followed by the potatoes, cinnamon stick and star anise. Add the water, dark soy sauce and sugar, bring to the boil and allows to simmer for 20-25 minutes, until the chicken is tender and the potatoes are cooked. Top up with some water if it's too dry. You want lots and lots of the delicious gravy. Transfer to a large plate and serve with either flat wide noodles or steamed rice. The choice is yours. This looks great, I love Xinjiang cuisine. We have lots of restaurants here in Sydney - love the spicy lamb skewers the best - I could eat them all day. Thanks for sharing this recipe - I'll definitely give it a go. Looks amazing! Will definitely make it and report back. Hi I made this disk successfully tonight. I notice there's no mention of when to add the Shao Xing wine so I just added it with the water! Delicious!